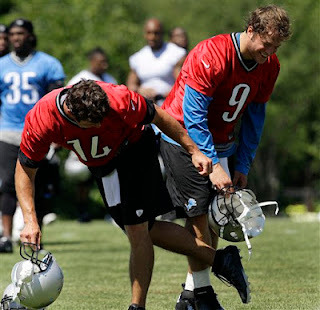 Quarterback Shaun Hill was a perfect fit for the Lions from Day One. Entering his third season in Detroit, he’s a solid backup. Here are three reasons he is one of the best backups in the NFL. 1. He knows his role will always be as Stafford’s backup. There’s no drama that comes along with Hill. Of course he wants to be the best, but he knows Stafford is the franchise guy. Attitude is everything in an NFL backup quarterback. He and Stafford seem to be good buddies even away from the football field. 2. Hill is a darned good quarterback. He proved it in the 2010 season when Stafford missed most of the season with shoulder issues. 3. Hill prepares as if he’s going to start every game. Some guys say that, but Hill does it because he never knows. Because he’s got more experience than Stafford, he’s helped in his development too.